Now, with new owners and a new board – Genesys is poised for a “new conversation” about contact centers. This will begin after a few moments of the “your call is very important to us” riff. Actually, why wait? Let’s turn to social media for more immediate results. I generally don’t cover contact centers too closely, but here is what I know. The term “Call Centers” got changed to “Contact Centers” by the vendors to reflect their ability to support more than calls; such as IM, email, video, social integration. Unfortunately, the vast majority of contact centers are still call centers, however, the shift is occurring. Social media offers an interesting twist – rather than just another form of communication – it offers potentially more information about the customer as well as an increase in risk associated with poor a customer experience. There are two major business aspects to social media: promotional efforts (brand awareness, brand monitoring, prospecting), and customer service integration. The practice though, of giving customers with more social influence better service is controversial and potentially flawed. End users and the vendors are very aware of social media – stories like United Breaks Guitars – send shivers down the spine’s of customer service managers. The contact center vendors, across the industry, are working to integrate various aspects of social media into their solutions. Why not turn the table and use social media to see what Genesys is planning? Typically, the hosts of such industry briefings encourage attendees to tweet away – with the exception of “NDA” or road map content. That is, they want to spread the word and capture the excitement these events offer. I started with the event’s hashtag (#GIACSF12). If you are not familiar with such things, a hashtag is a code people apply to their tweets to self sort their interactions. However, it is important to note that hashtags are both manual and voluntary. The tweets I reviewed reflect those with the hashtag, there were many more tweets. In fact, two of the tweets included below are retweets where presumably the original tweet did not include the hashtag. When the event was said and done, there were 759 tweets referencing #GIACSF12, according to Tweetreach, these reached 75,074 people. 302 were regular tweets, 82 replies, and 375 retweets (RTs). Of course, that breakdown is only an estimate as there are no set rules of what defines RTs and replies. The RT is another voluntary designation with variability in how it is performed. 759 total tweets seems pretty good for a two day event with about 30 people. Almost half being RTs. Each RT further propagates the social message by amplifying it – I tell two friends, and they tell two friends and so on and so on. Event organizers typically love RTs – it’s a form of social validation; here here! I’ve attended several conferences remotely, but never via Twitter only. I thought with all these tweets, it would be easy. I was wrong. As a wise man once said “Being there is best, but for those that can’t following #GIACSF12 on twitter is the next best option :-)” Or perhaps he meant to say the only option. Genesys didn’t stream or publicly post any of the sessions. Remote streaming isn’t very common in UC – though I will give points to Enterprise Connect for streaming at least the keynotes. IBM posted a handful of sessions from LotusSphere. Avaya and Cisco are generally very good about it at their events. The cloud folks are the best Salesforce.com Dreamscape, Google Atmosphere, or any of GigaOm’s conferences are very friendly for remote attendees. Last year, I attended about 25 conferences often hearing about how technology and rich collaboration can reduce travel. 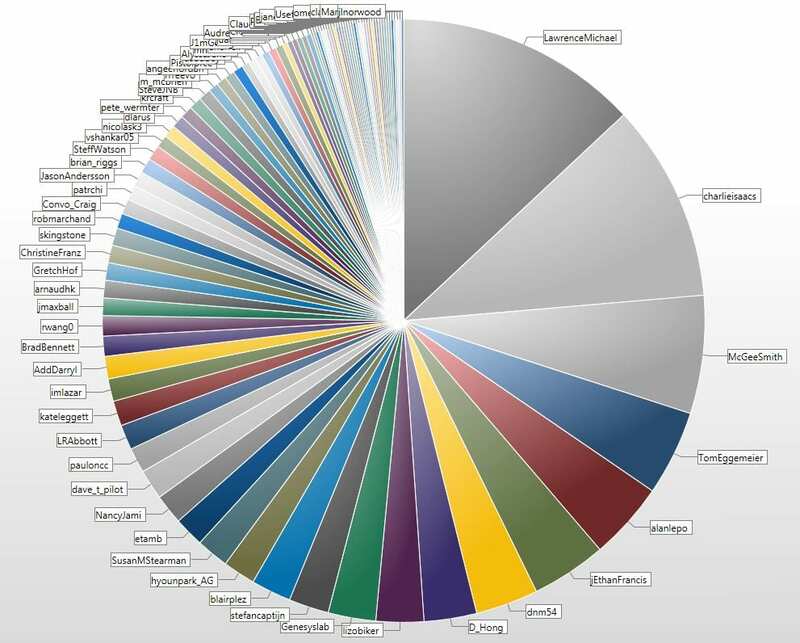 Here’s a nice graph of who was tweeting the most. It’s worth noting that about a third of the total tweets came from Genesys employees. (LawrenceMichael, CharlieIsaacs, TomEggemeier, Stefen Captijn, Genesyslab, and LizoBiker). But Tweets and influence are not the same thing. Tweetreach reports the tweets had 1,669,087 impressions. I believe that’s follower count times tweets for each tweeter. Here’s a list of the each tweeter’s reach with over 10,000 impressions. When I look at a list like that, I think – I hope Charlie Isaacs tweets this post. 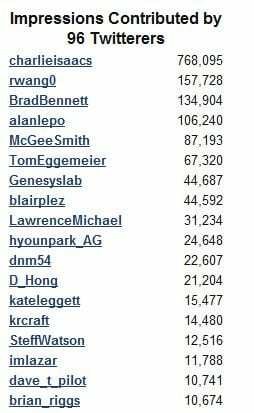 What’s really interesting here is rwang0, SteffWatson, BradBennett, and HyounPark_AG among the most influential in the event’s Twittersphere were not even at the event. Attendance wasn’t required for all of the speakers either. One was brought in via Skype (yes Skype). But using Twitter to evaluate influence is inherently flawed. Many analysts don’t tweet. Several Gartner analysts were in attendance (four I think), but only SteveJNB tweeted (and he wasn’t there). Perhaps Klout is not that reliable (say it isn’t true). Clearly, the social/contact center integration story still has some maturing to do. McGeeSmith-Great, non-tweetable stuff RT @LawrenceMichael: #GIACSF12 Merijn te Booij has opened the roadmap scrapbook for analysts. SusanMStearman-Good content focused on #custserv superstardom RT @LawrenceMichael: #GIACSF12 Merijn te Booij has opened the roadmap scrapbook for analysts. jmaxball-#GIACSF12 Genesys Board chats with the Analysts – as an employee I’m really looking forward to this. One cannot really follow a conference by monitoring tweets alone. That said, it is also important to note there are is a tremendous amount of quality information shared and made readily and freely available. That said, these events are bit like a firehouse. There is no way to digest and process and tweet all in real time – in a meaningful way. The wine selection at dinner was very good. Of course Genesys is (formerly?) a French company. Identifying the influential on Twitter is not practical using Twitter tools alone. Twitter, encouraged or not, is not an effective social networking strategy to get the word out. If you want to get the word out, a broader social strategy likely involving posted content is necessary. Perhaps Twitter is an escape from the monotonous droning of how past performance is not indicative of future results and lookie here. That is is healthy distraction in which we share positive news and create community. That the open conversations and reaffirmations with existing relationships is what is truly important. That the audience must come first, and the content will follow. Regardless, it seems like it was a highly successful event, and the analysts in attendance were quick to share their appreciation for the informative content and hospitality.